Obama: pro-surge, pro-troops, and pro-victory by next month? That's Goldfarb's forecast and I'm betting he's right. Bill Foster please note Obama's change on FISA and the polling numbers in Goldfarb's link. But Obama is a man of change. Just in the last week he dropped his opposition to telecom immunity, his support for handgun bans, his pledge to take public financing and renegotiate NAFTA--all core issues for Obama, or they were supposed to be. So what issue will he shift on next? After looking at the numbers from yesterday's Quinnipiac battleground polls, we're betting Iraq. It turns out that Americans as a whole aren't nearly so eager for surrender as the left-wing of the Democratic party, and Obama isn't much for staking out unpopular positions. The left should brace itself: Obama's going to be pro-surge, pro-troops, and pro-victory by this time next month. "The President and his allies in Congress are playing politics with national security, and that's wrong. Nobody is above the law and telecom companies who engaged in illegal surveillance should be held accountable, not given retroactive immunity. I flatly oppose giving these companies an out for cooperating with Alberto Gonzalez on short-circuiting the FISA courts and the rule of law." ...said the bill's target should not be the phone companies' culpability, but "can we get to the bottom of what's taking place, and do we have safeguards?" Culpability ...illegal surveillance of terrorists days after thousands of Americans dead at the WTC and Pentagon. Neither of these two quite gets it. OBL's declared war on the United States and all the liberal world believes in. Listening in on the enemy's phone calls is not a threat to civil liberities. It's the defense of liberty. Bill Foster must think we in the sticks need big glossy pics to answer the questions on the small card attached to this Public Document for Official Business at the taxpayer's expense. Gosh darn but we ain't that stupid. Obama continues the sweetie gate frame. You really have to wonder where Obama's been to talk like this. Gateway Pundit via Rezko Watch. "[B]ecause of the campaign that Hillary Clinton waged, my daughters and all of your daughters will forever know that there is no barrier to who they are and what they can be in the United States of America. They can take for granted that women can do anything that the boys can do (cheers begin) -- and do it better, and do it in heels. I still (Obama laughs) -- I still don't know how she does it in heels." Picture at left is Iraqi-British billionaire Nadhmi Auchi, Gov Blagojevich, and Iraqi-American (and Chicagoan friend of Rezko) Ayham Alsammarae (then Iraq's Minister of Electricity under Bremer's CPA) at a dinner thrown for Auchi in April 2004 at the Four Seasons. Obama probably dropped by for a toast. Mr Auchi ought to know when you wade into Chicago politics sometimes the crud sticks to your pants because now he wants to sue Evelyn Pringle over her Cliff Notes on just what all these fellows where up too that night. Although you have never informed me of your client's objections to my articles, it has been brought to my attention that you are attempting to intimidate sites that publish my work by threatening to sue them for defamation. I ask that you cease this tactic immediately. Your actions are not only violating my right to free speech but they are also adversely affecting my business relationships and livelihood. I will gladly defend any action filed against me in the US by your client. However, in order to sue me he would have to appear here before a jury and you and I know he is not allowed in this country. Therefore, your actions represent harassment and unlawful intimidation of a professional journalist. If I get any more reports that you are trying to sabotage my relationships with publications, I will contact the US attorney, Patrick Fitzgerald and the US Department of Justice to seek legal advice on how to put a stop to your illegal conduct. I will be forwarding a copy of this email to all of the sites that publish my work. If Mr Auchi was allowed in this country, I would be the one filing a law suit against him. Also, Freddy Gay's Eye Spy in The American Conservative. Barack Obama should be grateful for Britain’s restrictive free speech laws, according to London’s most fearless magazine, Private Eye. The Eye, which often covers stories other magazines won’t touch, claims that aggressive libel lawyers in Britain have censored web reports on Nadhmi Auchi, the mysterious London-based Iraqi billionaire who has been linked to Obama. If you come to Chicago and dine with the heavy-hitters and only come out of it with a case of indigestion, you're probably ahead of the game. Should have stayed home in London Mr. Auchi. MSBNC on the Left-Center strategy. Mr. Obama has executed several policy pirouettes in recent weeks, each time landing more toward the center of the political ring. On Wednesday in Chicago, he confirmed that he would not fight a revised law that would extend retroactive immunity to telecommunications companies that helped the government spy on American citizens. (He had previously spoken against immunity provisions in an earlier version of the bill.) And recently he backed away from his own earlier support for campaign finance spending limits in the 2008 election. Mr. Obama describes his new turns as consistent with long-held beliefs. On Wednesday he painted his decision to opt out of the campaign finance system as a reformist gesture, noting that most of his donors are not wealthy. “Our donor base is the American people,” he said, adding that this was the thematic goal of campaign finance reform. No kidding.... a blank screen the NYT thinks folks won't be able to see through either. If we as a community are truly concerned about wanting a state-of-the-art high school in Austin and want it to be a safe environment, then we need to take a page from the Mayor's handbook and put the school in a location where our children can feel just as safe as those who attend his alma mater. So I want to be the first to put forth my suggestion for an alternative site. On Madison Street at Menard Street sits the brand new 15th District police station. It also has sitting across the street, 3 blocks of prime business land that was used to put in several parking lots for it. My suggestion is, rather than place a brand new school in a neighborhood that is still struggling socially, put the new high school for Austin on the land currently used as parking lots for the 15th District. With a school directly across from the police department, our children, like those at DeLaSalle, can concentrate on their education without the worry of having to deal with gang-bangers and drug dealers. I still like the notion of putting a casino at Brach's but a new distribution site works. Jones nailed it here on where that new school should go. On a related development note... there is a Menards coming to North and Kostner. I think it's the third store in the city. Strange how Menard's escaped the kind of flak thrown at Walmart considering stories like this: Slaves for big money at Menards. Menards must have better PR folks. Blagojevich: "...as they say in the Bible, the truth shall set you free.."
In March 2007, Blagojevich refused to answer whether he had been interviewed by federal investigators after 2005 during an appearance before the Tribune's editorial board. "I'm happy to make an appointment, talk to you guys about that," Blagojevich said then. "But I feel real good about all the different things that we do because we follow the rules and we do things right and at the end of the day, as they say in the Bible, the truth shall set you free. The truth is what it is. And the truth is we do things right." Also today's Sun Times: Who lied, witnesses -- or gov? As Rev Wright says, Blagojevich just doing what politicans do, at least in Illinois it seems; and doing it audaciously. I hope they have some good lawyers; dogged folks who'll follow the trail. A firm with good PR people to feed info to the bloggers. “A Texas-based legal firm would lodge an Iraqi government lawsuit at state court in NewYork”, Iraqi Justice Ministry source, who requested anonmity, told Aswat al-Iraq-Voices of Iraq(VOI). The source noted “Iraq file the case to catch up with its deadline expiring by the end of June”. The Oil-for-Food Programme, established by the United Nations in 1995, which started working on April16th 1996 and terminated in late 2003, was intended to allow Iraq to sell oil on the world market in exchange for food, medicine, and other humanitarian needs for ordinary Iraqi citizens without allowing Iraq to rebuild its military. The programme was introduced by U.S administration in 1995, as a response to arguments that ordinary Iraqi citizens were inordinately affected by the international economic sanctions aimed at the demilitarisation of Saddam Hussein's Iraq, imposed in the wake of the first Gulf War. The sanctions were discontinued on November21, 2003 after the U.S. Invasion of Iraq, and the humanitarian functions turned over to the Coalition Provisional Authority. As the programme ended, there were revelations of corruption involving the funds. According to an interim report released by an idependent commission led by former Federal Reserve chairman Paul Volcker food aid supplied under the programme "was unfit for human consumption". The report concluded that former regime of Saddam Hussein had gained nearly $1.8 million in bribes and paybacks skimmed over the course of the programme. The documents indicate that prosecutors considered offering witnesses to explore why Rezko used others to contribute to Obama and also to Blagojevich, and U.S. District Judge Amy J. St. Eve ruled that they could. But they did not end up offering any such testimony during the trial. "Witnesses will testify that Rezko was a long-standing supporter and fund-raiser of Barack Obama," prosecutors wrote. Newly unsealed court files in the Tony Rezko corruption case show that federal agents interviewed Gov. Blagojevich "on multiple occasions" and that the governor denied having conversations described in court by two key prosecution witnesses. Walls are closing in and the air is getting thin for the Governor. He won't go down alone. Comrade Klonsky goes under the Obama bus. Better than the fate that befell those at Lubyanka I guess. Recall what would happen in Soviet Russian textbooks when a trotskyist or bukharinite got purged by Uncle Joe, as Klonsky lovingly recalls the dictator Joseph Stalin at this reunion of SDS in November of last year in Chicago? Their pictures get airbrushed out of the old photographs. Earlier today when one went to the Community Blogs on the Obama website there was the Klonsky blog on education policy and something he calls "social justice teaching." Tonight, all you get at the same URL is: "Invalid blog/profile URL." Today's softer version of the Stalinist airbrush. The Journal also reports that the DNC will be using "beer waste" to power the buses at the convention. I don't know what that means either, but I spoke to Matt Burns, spokesman for the Republican National Convention, just a few minutes ago to ask him a few questions. He assured me that the Republican party is "committed to hosting a green convention," but that delegates, press, and everyone else in attendance would be able to eat all their favorite fried foods. Further, he assured me that Republicans would be "drinking our beer, not burning it." In an interview, Illinois Attorney General Lisa Madigan said Countrywide "broke the law and we plan to hold them accountable for that." She added that Countrywide's actions have led to widespread foreclosures in her state and have wrecked havoc around the world. "The impact on individual homeowners and communities and the country and the global economy is unbelievable." Have to wonder where she expects the Friends of Angelo trail to lead. The RNC ad plus more over at Rezko Watch. "There are circumstances beyond our control, and I think I am better able to handle things that I have no control over. "It's a horrible prospect to ask yourself, 'What if? What if?' But if certain things happen between now and the election, particularly with respect to terrorism, that will automatically give the Republicans an advantage again, no matter how badly they have mishandled it, no matter how much more dangerous they have made the world." I think another attack likely and I don't think it would help the GOP. It would set the GOP up for a charge the left America open for another attack. Because Bush failed to get OBL maybe? Black's error may be not in channeling HRC from a few months ago, but instead automatically assuming Americans won't be outraged with the Administration instead. If Obama elected, this is the fear he will live with too for four years. That there will be a terror attack under his watch and the GOP will turn it on him as a sign of weakness. Samantha Power, Austan Goolsbee, Rev Wright, Grandma, Father Pfleger, Jim "Friend of Angelo" Johnson, and now little Vero the Possum all pitched and crushed under the Obama bus. They came at dawn, thousands of Iraqi troops and US special forces on a mission to reclaim a lawless city from the militias who ran it. By the end of the day, al-Amarah was under Iraqi Government control - without a shot being fired. 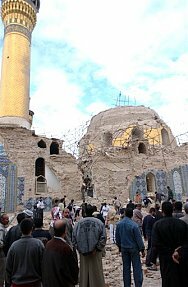 The city had been taken over by the Shia al-Mahdi Army two years ago after British troops handed it to an ill-prepared Iraqi Army. “We can't say al-Amarah was entirely bad, there are good people here, poor people. But the city was controlled by the al-Mahdi Army, and these people are all backed by Iran,” said Captain Hussein Ali of the Scorpion police brigade, one of the Iraqi units drafted in to take part in Operation Omen of Peace. Dodd at least, thinks were stupid Tony. Rice in a deep moment. HT: I Know You Are, But What Am I? I'd settle for just some consistency from Dr. Rice. Here's what the leftish Institute for Public Accuracy had to say about her today. Now, what does she think of Obama advisor William Perry's call in 2006 for a preemptive strike on North Korea? I'm betting the Obama smear site ignores this. No wonder Obama is reluctant to go to Iraq. An Iraqi judge, not to mention the Iraqi public, understand how Rezko's friend Alsammarae helped loot the Iraqi people. Talisman Gate who deserves a medal from the USG for translating these articles for us. The link, and some key quotes about how the Iraqi public views Alsammare... Congressman Waxman, whatever happened to those hearings on corruption during reconstruction? Oh how so many Democrats have so cravenly caved here. Alsammarae’s financial crimes are widely perceived by the Iraqi public as the reason behind the government’s continuing failure to provide enough electrical power to Iraq’s population. Another widely-held perception is that Alsammarae embezzled hundreds of millions of dollars during his tenure. Judge al-Bairaqdar clarified that some verdicts and charges against Alsammarae fall under the newly-passed Amnesty Law, but that there are still others that were not covered under the amnesty and hence are still in effect. He added that the documents that Alsammarae had presented at the press conference he held four days ago in Amman are not enough to exonerate him from a legal standpoint. Y'know, given how close Alsammarae was to Antoin Rezko, and how close Rezko was to Barack Obama, I'm certain that Alsammarae and Obama are intimately connected, and that at least some of Obama's worldview of Iraq was inferred by a slime-bucket such as Alsammarae, who now wants insurgents to kill more Americans and says so at the top of his voice. Yet even though in the past Alsammarae's story has been extensively covered by CBS, CNN, the New York Times and many others, his current shenanigans are being studiously ignored, presumably lest they reflect badly on the media's preferred presidential candidate: Mr. Obama, the anti-Iraq War candidate. Part of why America went wrong in Iraq was its reliance on the likes of Alsammarae. His prosecution and conviction are part of the remedy; the likes of Alsammarae should never again be allowed to sabotage the Iraqi economy, and then get a free pass from U.S. officials. Does Obama agree? Is there a journalist out that cares to ask him about that? And it's not as if Obama is being asked about some obscure angle of foreign policy; the course to be taken in Iraq will be one of the most important issues, if not the most important issue, of this election. Alsammarae and Obama's relationship to him are two storylines that are consequently, and definitely, relevant to the latter's candidacy. But it's real hard to bring-up the Alsammarae affair within the format of a fluffy, soft-ball question, ain't it? And man how MSM has failed America and Iraq with their silence on Alsammarae. Jim Glanz... you of all people should understand Chicago. Why aren't you reporting this? You didn't overlook Alsammare before the connection to Rezko and Obama. I wish Obama would acknowlege we are allies with Muslims fighting a foe who destroys Mosques, instead of shunning them. Michael Goldfarb doing a great job on the blog. Two good posts: Kerry: Obama Will Give bin Laden Habeas and Talk About Your Consummate 9/10 Democrats. Obama's fight the smears site: what about Alsammarae's Press Conference? Talk about at smear that deserves a rebuttal on this site. I'm sure waiting to see how Obama fights back on this one: Pro-Obama Iraqi-American Ex-Convict Supports Increased Attacks on U.S. Troops. What are we to make of smears that never get rebutted? PJ Media: Obama’s Shifting Positions on Iraq: A Rezko Connection? Richard Fernandez sees a pattern with Alsammarae, Auchi, Obama, and Rezko. How does Durbin square his past words with a fundraiser for the PAO during the debacle with Abu Garib? This is a bit much for Democrats to expect the public to swallow. Figen shared with me what it was like to spend 7 months under Iraqi occupation. As she told me the horrors of living in Kuwait under the occupation, I realized that if we had not had the first war, Saddam may have been impossible to stop with the oil under his total control. The men who did terrible things to the Kuwaitis, especially the Kuwaiti women are very similar to the men we are fighting. As people get upset about Abu Ghraib, one thing that should never be forgotten: these are men who have murdered Americans and would continue to murder Americans if given the opportunity. The truely appalling thing for a PAO is she never wrote in her blog that it was American soldiers who blew the whistle on Abu Ghraib (I've often listed the cite for these heros from the Taguba Report). That an American Army started the investigation on its own troops who abused prisoners regardless that those prisoners may have murdered Americans, and maybe would continue to murder Americans if given the opportunity. Not many Army's do that, and if ours had managed this episode better, it might not have cost the United States so. This PA disaster was really a bitter defeat (fueled by Durbin's poor choice of words I'll leave you all to google for yourselves) for the United States and the US Army. The video is over at Hot Air. Wonder if Obama is awake during those Intel briefs? I had seen part of Alsammarrae’s General Intelligence Directorate file back in Baghdad, and he’s identified as a snitch that had worked for the Saddam regime while he was a student in the 1970s, reporting on the political activities and utterances of fellow Iraqi students then pursuing their degrees in the UK. Al-Samarie was the highest Baathist official in North America; he held the rank of Branch member in the Baath Party. He was in charge of the Regional baath party command and National baath command in North America, as matter of fact, the former Iraqi Ambassador 'Mr. Nazar Hamodoun' was reporting to AlSamarie, also Saddam Nephew 'Fadel Alsafige' used to report to AlSamarie. AlSamarie attended school in Illinois Institute of Technology in Chicago, Illinois, he received his master degree and doctor (PhD) degree in electrical engineering,the government of Saddam Hussien paid all his tuition and expenses, and paid him a salary too, the records of Illinois institute of technology shows that, though he was a student, but he was the most senior, powerful Baath party member, he caused several students who disobeyed his orders, to be locked in Iraq, when they went to visit their family's. Al-Samarie was fired and kicked out of the Baath Party by Saddam Hussien, not what Alsamari proclaimed to the public that he left the party on his own or because he believes in democracy and liberty. Al-Samarie fired and kicked out of the party due to the involvement of his brother in-law, and his uncle in baghdad, in a conspircy with Syrian baathist to take over the government in Iraq. WNN gives a nice short wrap up on the Alsammarae story: Meet Obama's new albatross: Supporter backs Iraqi terror And adds a few more pieces...or makes it all more complex. Now he hopes for a return to Iraqi politics as a result of a recently passed amnesty law in the parliament. He said in Jordan yesterday "the [insurgency] in Iraq is a legitimate resistance, and it is against occupation, and any resistance in the world against occupation is considered legitimate. I hope that [it] continues and avenges the Iraqi people, and I look forward to expanding its political agenda." He also said he is still a part of Allawi's political bloc. Radio Sawa is a 24-hour Arabic-language radio network that originates in Dubai, the United Arab Emirates and Washington and receives support from the U.S. government. I didn't know Alsammarae was ever part of Allawi's bloc. Joining the resistance after it's been largely defeated an interesting move. The resistance also tried to blow up Alsammare once. (I'll have to google around for the link but the resistance made a point of saying the found Alsammare a double crosser as I recall. Radio Sawa funded in part by Washington. That'll get conspiracy theorists humming. A friend sends another link. I think Alsammarae's move timed more with the Jury's decision on Rezko than what any court in Iraq did... if a court in Iraq did anything. Former Iraqi electricity minister Ayham al-Samarrai announces to the media in Amman on June 15, 2008 that he was acquitted by an Iraqi court of charges of negligence and corruption. The former minister who also carries a US nationality said he plans to go back to Iraq to resume his work in politics. Samarrai had escaped from a Baghdad prison in December 2006 , just two months after he was jailed for corruption. Whow...no sooner do I comment to Bored Now about waiting for Rezko to talk about friend Ayham Alsammarae and Alsammarae (the guy who put up bond for Rezko) talks, and talks tough. Talisman Gate via Rezko Watch. There’s so much vileness here that I really don’t know what to mop up first. Alsammarae, an Iraqi-American Chicagoan, added during remarks carried by Radio Sawa (Arabic link) that he had contributed the maximum allowable of $2,300 to Barack Obama’s campaign. But there’s another Obama link to Alsammarae: while serving as electricity minister Alsammarae had been involved in brokering deals in the Iraqi electricity sector for Antoin Rezko, Obama’s long-term friend and patron. Rezko is the Syrian-American hustler who was convicted of fraud in an Illinois court on the day that Obama secured the Democratic nomination. Talisman Gate told me the fellow to the right of Blagojevich at that dinner in 2004 at the Four Seasons was Alsammarae. The other is a photo of Alsammarae at this Press Conference. WaPo: A Partnership With Iraq The Shiite government signals a desire for an alliance with the United States. Shouldn't that be welcomed? WaPo's full Editorial. Shows how unbalanced Democrat's policy on Iraq has become. So much for multilaterilism and working with allies. THOUGH IT was hardly noticed in Washington, Iraq's Shiite-led government sent a powerful message to Iran and to the Middle East last week. Prime Minister Nouri al-Maliki, whose coalition is often portrayed as an Iranian client, traveled to Tehran for a meeting with supreme leader Ayatollah Ali Khamenei. The ayatollah bluntly declared that Iraq's "most important problem" was the continuing presence of U.S. troops. He pressured Mr. Maliki to stop negotiating a package of agreements with the Bush administration that would delineate a "strategic framework" between Iraq and the United States and provide for the deployment of U.S. forces beyond the expiration of a U.N. mandate at the end of this year. Mr. Maliki refused. He assured his Iranian hosts that Iraq would not be a launching pad for an American attack on Iran. But he pointedly told a press briefing that negotiations on the strategic partnership would continue. He repeated that commitment on Friday, even after warning that the talks had "reached a dead end." In effect, the Iraqi prime minister was saying that his country does not want to become an Iranian satellite but an independent Arab state that would look to the United States to ensure its security. This would seem to be an obvious U.S. gain in what, according to Sen. Barack Obama (D-Ill.) as well as President Bush, is the urgent task of countering Iran's attempt to dominate the Middle East. It means that Iraq, a country with the world's second largest oil reserves and a strategic linchpin of the Middle East, just might emerge from the last five years of war and turmoil as an American ally, even if its relations with Iran remain warm. So it's hard to fathom why Democrats in Congress have joined Ayatollah Khamenei in denouncing the U.S.-Iraqi agreements even before they are written. Critics such as Sen. James Webb (D-Va.) are professing to be outraged that the Bush administration might be forging a relationship with Iraq "that parallels the Korea-Japan history," as Mr. Webb put it. They claim to be shocked by the suggestions of Sen. John McCain (R-Ariz.) that U.S. forces might remain in Iraq for decades without controversy if they did not suffer casualties, as has happened in Japan and South Korea. Yet the U.S. alliances with Japan and South Korea have been among the most successful in this nation's history. While building a similar bond with Iraq may prove impossible, it's hard to understand why Democrats would oppose it in principle. In fact, much of the controversy over the negotiations is based on misinformation, some of it spread by Iran's proxies in Iraq. There are claims that the Bush administration is seeking to establish scores of permanent U.S. bases. In fact, Iraq has merely asked that the agreement list the bases from which American forces would be permitted to operate. It is claimed that the deals would perpetuate the U.S. "occupation." In fact, they would be a major step in the opposite direction, by placing American troops under the sovereignty of the Iraqi government rather than the United Nations. If the United States were to make a formal commitment to defend Iraq from external aggression, congressional consideration and approval of the pact would be appropriate. For now, the biggest risk is that Tehran and its allies will pressure Mr. Maliki into backing away from a partnership with Washington. In that case, Iran would hasten to substitute itself as Iraq's defender and strategic ally, with momentous implications for the rest of the Middle East. Surely this is not what the Democrats want. Good column in the American Thinker. Another tip from Rezko Watch. But if we step back from the left-wing lens, what do we see? A political apocalypse? A leftist tsunami? Some unimaginable historical synthesis bearing down on us? No -- what we in fact see is a very slick and adept Chicago pol, in prophet's rags a little too large for him, with a political party clinging to his goatskin tails. It's this, and this alone, that has so frightened the GOP and sent conservatives into catatonia. What this collapse is about is not at all clear. Barack Obama is alive and fighting, no more than that. His battle with Madame Hillary has leached virtually all momentum from his campaign. He has spent months calling in airstrikes on his own position and setting up booby traps and minefields in areas that he now has to cross. His primary campaign could be taken as a textbook example on how not to set yourself up for the national contest. And the numbers show it: even with his nomination "bounce", Obama is according to CNN, only 3 points ahead of McCain -- a statistical tie. Giannoulias on Rezko: "I would love to, but I can't,"
Kristen McQueary on our ernest but naiveTreasurer in the SouthTown HT Rezko Watch. I guess there are some limits to Yes we can. Before being elected state treasurer, Giannoulias was vice president of his family's North Side bank, Broadway Bank. Rezko was a client. In addition to at least one loan secured through the bank, Rezko held a checking account there. Rezko is accused of writing nine bad checks from the account totaling more than $400,000 to Las Vegas casinos, Nevada authorities revealed last month. Wouldn't you know it? Rezko liked to gamble, just like his pal Christopher Kelly, who faces federal charges in a separate case alleging he hid gambling debts and cheated the IRS. Both men were close advisers to Blagojevich. Giannoulias could not, and would not, elaborate on his specific financial dealings with Rezko because as a banker, that information is private, Giannoulias said. "I would love to, but I can't," Giannoulias said. As for Rezko's bounced checks, Giannoulias said they simply show "the bank did the right thing." In other words, the bank didn't help Rezko by covering the losses. Giannoulias said he oversaw the loan portfolio of the bank anyway and would not have been aware of Rezko's bad check-writing habits. In short yes-and-no answers to my questions, Giannoulias said Rezko never asked him or Broadway Bank to help with the gambling debts; Rezko wasn't steered to Broadway Bank by Barack Obama, a mutual friend; and Rezko had no personal connection to Giannoulias, other than as a bank customer. Two paragraphs from Matthew Continetti's The Gitmo Nightmare. I have a feeling the practical result well be few unlawful combatants ever leave the battlefield. The Administration and Congress came up with about a humane a policy as we can get. Now rather than getting to Lawyers and Courts, these fellows will never make it off the field of battle. Continetti points out the best arguments against this appalling decicion come from Kennedy himself. In his opinion, Kennedy conceded that "before today the Court has never held that non-citizens detained by our Government in territory over which another country maintains de jure sovereignty have any rights under our Constitution." Inventing rights seems to be what some of today's Supreme Court justices do best. In 1950 the Court ruled in Johnson v. Eisentrager that foreign nationals held in a military prison on foreign soil (in that case, Germany) had no habeas rights. But, without overruling Eisentrager, Kennedy said the Guantánamo detainees are different from the German prisoners 58 years ago. Why? Kennedy wrote that Eisentrager had a unique set of "practical considerations," and the United States did not have "de facto" sovereignty over Germany as it does over Guantánamo Bay. That territory, "while technically not part of the United States, is under the complete and total control of our Government." But these slippery distinctions only raise more questions. Doesn't the United States government exercise "complete and total control" over its military and intelligence facilities worldwide? If so, what's to stop foreign combatants held in those locations from asserting their habeas rights? CNN's Michael Ware examines the largest collection of al Qaeda in Iraq documents ever to fall into civilian hands, discovering surprises about how the insurgents operate and clues about their strength today. The concluding paragraphs from the story plust a photo of the four slaughtered Russians via Gateway Pundit. In a vein similar to the Khmer Rouge's grisly accounting of its torture victims, within the files of one al Qaeda headquarters in Anbar alone was a library of 80 execution videos, mostly beheadings, none of which had been distributed or released on the Internet. And all were filmed after al Qaeda in Iraq ended its policy of broadcasting such horrors. So why keep filming? According to former member Abu Saif and the senior U.S. intelligence analyst, to verify the deaths to al Qaeda superiors and to justify continued funding and support. The videos also bear insight into al Qaeda's media units. Raw video among the catalog of beheadings shows how al Qaeda's editing skills hide not just its members' faces (caught in candid moments on the un-edited films) but also their failures. When three Russian diplomats were kidnapped and killed in June 2006, a well-polished propaganda piece was released. It showed two diplomats being gruesomely beheaded, and yet the third diplomat was shot with a pistol, in a different location. The full video of the slayings answers why. Though bound and blindfolded, the third diplomat struggled so defiantly that his ailing executioners could not draw their knife across his throat. In the horrific and chaotic scenes, the faces of his killer and the cameraman are seen. And those scenes, like the intricacy of the prince of Anbar's planning and internal analysis of Operation Desert Shield, reveal an al Qaeda in Iraq that the world still barely knows. Obama has more preconditions for a town hall with John McCain than for a meeting with Mahmoud Ahmadinjead, the head of a terrorist state. And the way in which the campaign went about this--dropping the news on a Friday afternoon, having surrogates lined up to spin it as if we had declined their offer, and making it sound as though they'd met us half way with five debates, when in fact they are only offering one town hall--shows Obama isn't all that serious about change. The McCain campaign is willing to go anywhere Obama likes, and anytime--and when we say it, we mean it. We'll have the debate in front of Obama's house in Chicago if he wants--as long as the voters can engage the candidates and ask their questions. Anywhere, anytime. Thesre aren't the Chicago boys I fear, but Klein does give us a nice column on Obama not being quite what he seems. Carl Davidson, how feel the progressives on this one? There is the Obama you hear, the Obama you read, and the Obama who appoints advisers; and they can all be very different sorts. Update: Also, Rob writes When Will Obama Be Firing His New Economic Adviser? Was the hiring a reach out to moderate and conservative voters? Or does Obama really feel as Jason Furman does about economics and is merely lying on the campaign trail when he criticizes tax cuts for corporations and preaches wage stagnation? Either Obama’s posturing or guilty of making campaign promises. Neither speaks well of his leadership. Heck of a time to bring the Democratic National Committee to Chicago. From yesterday's Daily Hearld editorial: Now Democrats are hurting themselves. The impeachment memo, meantime, has the potential to further harm Democratic presidential nominee Barack Obama. If they aren't already, McCain's camp and the national media soon will be asking Obama what the heck he's doing about his party's mess in Illinois. Obama is supposed to be ready to run the nation and yet, they will say, he can't exert any discipline or control over his now-former pastor, Rev. Jeremiah Wright; his friend, the Rev. Michael Pfleger; and now over Madigan and the other Democrats who control our state. Democrats in the state need some political leadership. It's time. It's an ideal time for Illinois Republicans to capitalize on this leadership gap and regain some ground. It's time rank-and-file Democrats throughout Illinois demand a change they can believe in. Chicago's the last place I would have brought the DNC. Way to0 close to way too much baggage and all Fitz's Feds. From M SJ Online... Now lets see if Dems give her the boot and keep out Gov Blagojevich with his impeachment clouds. She’s not alone in refusing to support Barack Obama. And she’s not entirely alone in saying she’ll vote this fall for Republican John McCain instead. Encouraged by her sister, who has served in Iraq, Bartoshevich signed up as a supporter with “Citizens for McCain,” an arm of the campaign targeting Democrats and independents. She said she got a call from the McCain campaign, which then provided her name to a reporter. Illinois State Senator (and Rev) Meeks next under the Obama bus? Curious how MSM gives Meeks and Farrahkan such a pass on their homophobia. It’s heartening to learn that the U. S. Congress is targeting ministries that it suspects of violating the IRS nonprofit rule. Guess which ones? Trinity United Church of Christ which under Jeremiah Wright cursed America and hustles votes for liberal Democratic candidates? St. Sabina’s under Fr. Michael Pfleger which hits whitey and urges the election of Barack Obama for president? Rev. James Meeks who is both pastor of Salem Baptist church and a Democratic state senator and who regularly mixes political agendas with theological ones? No. Sen. Charles Grassley (R-Iowa) has launched a probe of six conservative televangelists which, Grassley said, “share the same branch of evangelicism and…promote socially conservative and public policy positions.” Meaning pro-life and anti-homosexual rights. Check it out... from April 5, 2004. Why is April 5, 2004, significant? Well, it was a mere two days after the famous April 3, 2004, private party at now-convicted felon, political fixer Antoin "Tony" Rezko's Wilmette mansion which he hosted in honor of Iraqi-British billionaire businessman Nadhmi Auchi. This is the very same party reportedly attended by the newly-minted Illinois senatorial candidate Barack Obama and his wife, Michelle Obama. It is the very same party at which then Illinois State Senator Obama reportedly "made a few toasts" to Mr. Auchi. It is the very same party which neither Sen. Obama or Mr. Auchi now recalls attending. More reason for those hearings on Iraq Reconstruction Senator Drogan. Obama's next problem: Police Torture? Retired detectives named in a decades-old Chicago Police torture scandal have been subpoenaed by a federal grand jury -- a clear sign a criminal investigation into former Cmdr. Jon Burge and others is ramping up, sources said today. Five to 10 detectives received subpoenas last week to appear June 19 before the grand jury. The probe is headed by Sergio Acosta, civil rights coordinator in the U.S. attorney's office in Chicago, the sources said. A spokesman for the U.S. attorney's office declined to comment, but pointed to a statement U.S. Attorney Patrick Fitzgerald made last September announcing his office is engaged in a criminal investigation into the matter. The Democrats running Chicago may finally be called to account on this one. Illinois House Speaker Madigan's impeachment memo on Gov Rod Blagojevich. The AP story here and Rich Miller has the memo here. Here's a hoot of a talkng point from the memo. What do you think that President Emil Jones will do if the House impeaches Governor Blagojevich? Isn't this a waste of time? President Jones isn't going to allow a trial of Governor Blagojevich. The Constitution requires that if the House impeaches the governor, that a trial be held in the Senate, with the chief judge of the Supreme Court presiding. That's what the constitution says. I'm not going to speculate about what the Senate will do, should the House impeach. That's premature - putting the cart before the horse. The first step is to begin an inquiry and see if there exist sufficient grounds for an impeachment. Forget EJ, will Obama keep Blagojevich as Super Delegate? Obama fumbling questions on Jim Johnson. 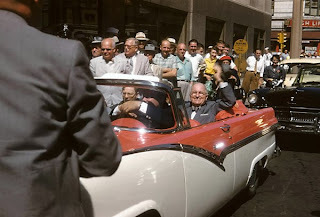 Milwaukee's Socialist Mayor Frank Zeidler (a guy I knew) and President Harry Truman in a parade in Milwaukee in 1957. Note there were no security or police to be seen. From JS Online's collection of Lyle Oberweis photos. Bill Ayers to join Rev Wright, Samantha Powers, and the others under the bus? Hot Air thinks the Obama bus is getting ready to claim another victim after check changing facts on Obama's fact check site. Also Rezko Watch has a guest post from Steve Diamond explaining it may have been Ayers Dad, Tom Ayers of ComEd, mentoring the young Obama. Copied in full from the Telegraph. Someone email me and explain what the heck this is about. As a regular host to prominent MPs and a guest of the Hinduja brothers at a Buckingham Palace garden party, Nadhmi Auchi usually relishes being at the centre of the action. The controversial Iraqi billionaire is, however, keen to disassociate himself from rumours about an extraordinary incident which allegedly took place at the Oxford and Cambridge Club in Pall Mall this week. Mandrake hears that a media awards ceremony, of which his wife is listed as a patron, turned into a melee after one of the speakers praised the role of Britain and America in Iraq. “Hamed al-Shareify, a former Iraqi ambassador to Kuwait, was subjected to abuse from certain members of the audience [unconnected to Mr Auchi],” says Adel Darwish, a respected Middle Eastern commentator. Last night, Mr Auchi, who was given a 15-month suspended jail sentence in France in 2003 for his part in the decade-long Elf oil corruption scandal, instructed his solicitors to let me know that, as far as he was aware, no such incident took place. "Mr Auchi is a very respectable gentleman and he would not allow himself to become involved in any such incident," says Michelle French, of Carter-Ruck. The lawmakers said they supported stepping up efforts in Congress and by the Federal Trade Commission to investigate whether fuel suppliers are “gouging” customers or colluding to fix prices artificially high. Foster noted that while crude oil – the raw material needed to create gasoline, diesel and other forms of fuel – costs more than ever, the companies that manufacture the fuel are reporting record profits. “As a businessman, this mystifies me,” Foster said. He said this mystery furthers his suspicion that the marketplace for petroleum and its byproducts is not functioning. Restore the market, he said, and prices should drop. The executive vp of Conoco Phillips John Lowe advanced some novel (sic) ideas for Congress to consider in addition to lifting the ban on drilling, like how about adopting a balanced energy policy? Do more to encourage alternative energy sources (offshore wind farms, for example), promote energy conservation, cut regulations that are preventing the construction of refineries -- and, oh yes, remove the tariff on ethanol. Congress slapped a 54 cents-per-gallon tariff on imported ethanol, thus blocking the import of low price ethanol from Brazil that would help lower gas prices for America’s beleaguered drivers. Dropping the tariff is one action that could provide some near-term relief. To end this courageous presentation by the energy companies, ConocoPhillips’ Lowe calmly concluded, "U.S. oil companies should be viewed not as scapegoats, but as assets. We must work together to find a real solution." American industry as an asset for the American People a notion beyond Scientist and Businessman Foster. He's just another Illinois Rezko-Democrat milking the politics while the citzens of Illinois get milked for the ethanol lobby. That should clear the mystry for you Bill. If Congress will only restore the market prices will drop. American industry as an asset for the American People may be a notion totally behind Scientist and Businessman Foster. He's just another Illinois Rezko-style Democrat milking the politics while the citzens of Illinois get milked for the ethanol lobby. Der Spiegel: Will Berlin's Lovefest with Obama be Shortlived? Germans are betting a lot on 15 minutes worth of chat. From Ralf Beste and Konstantin von Hammerstein in Der Spiegel. Obama, on the other hand, is as fascinating to German politicians as a mirage. He seems promising from afar, and yet no one knows what he actually stands for. In fact, hardly anyone knows him at all. Although he is a member of the US Senate Foreign Relations Committee, he has avoided contact with his foreign counterparts in the past. Steinmeier is one of a handful of German politicians who have spoken with the candidate, but only for a 15-minute telephone conversation. Nevertheless, his brief chat with the Democratic candidate qualifies Steinmeier as an Obama expert. Since then, his staff has raved about what they call the American's "altitude." They say that although his questions about world affairs were abstract, at least he seemed well informed. Besides, they add, Obama is apparently willing to call major tenets of US foreign policy into question. Mark Morford: Is Obama an enlightened being? Obama goes from Emil Jones's gofer in Springfield to Lightworker now for the masses through the eyes of a San Francisco columnist. Rezko requested Obama shine his light as a new US Senator at this 2004 dinner with Illinois Gov. Rod Blagojevich, Iraqi Billionaire Nadhmi Auchi, and Iraq's -now convicted for corruption- Minister of Electricity, Aiham Alsammarae. When will the light shine on the Obama and Auchi pictures? I'm sure they're hanging in someones office. Discretely now of course, but they'll be pulled out again sometime. Not for the masses to see maybe, but someone will be reminded of them for sure. Ø Did Halvorson ever meet with Rezko or Rezko's associates about the Third Airport? Ø If so, did Halvorson sponsor Senate Bill 2063 at Tony Rezko's request? Was anything offered by Rezko in exchange? Ø If not, still: why did Halvorson sponsor a bill that would have created ample opportunity for the same kind of cash-for-appointments schemes for which Tony Rezko was just convicted? "Rezko said that in order to get the governor's support for the things I wanted, the governor had to be given key appointments on the ALNAC board," Jackson said. "That is the same kind of thing they did with the Illinois Health Facilities Planning Board and the teachers pension system. "That's how Rezko used his influence, by appointing people to these boards. "I wasn't going to let that happen to ALNAC." "People wonder why I have been quiet for so long about the airport," Jackson said. "That's why I couldn't say anything. It was all about pay-for-play politics, and there was nothing I could say or do to move things along. "I've been criticized by people who say I should compromise to make the airport happen, and this is why I haven't compromised. "This is who I have to work with in this state. "I can't compromise because all of the people I am dealing with have different agendas than I do. "I'm a hero here. I refuse to compromise to pay-for-play politics." Jackson ought to take a look at Pamela Davis to see what happens to heros in Illinois. Neo Bushims from Savage Politics. Re: the second vid on Army shortage of translators: the Army typically hires them as local hires from the population. Do Illinoisans really care about Rezko? Shortly after it was announced that a verdict was on its way, the Web sites of the Chicago Tribune and Chicago Sun-Times were so overwhelmed with visitors that they both crashed. I don’t think that’s ever happened before. So, yes, people are very interested. Rezko Watch reviews Obama's anti-Jew problem on his blogs. It's not just bucks Obama's raisng from the web. He attracts the odd balls from under their rocks too. Update: The Weekly Standard's take. Having spent a few months in Iraq, I'm clueless why we needed to teach any Iraqi how to use an AK-47. The ones I met seemed perfectly comfortable with the weapon. With yesterday’s announcement that Tony Rezko is guilty of 16 counts in his corruption trial, it is time for Jill Morgenthaler to start answering questions. Morgenthaler, candidate for IL-06, was a senior advisor to the Blagojevich administration and was the one who helped find a location for Rezko’s company to train Iraqi police forces. How much did Morgenthaler know about Frawley and Rezko and the contract when she was doing Blagojevich’s bidding? Illinoisans are fond of complaining about political corruption, but what if the businesses and individuals who came in contact with politicians seeking bribes refused to play ball and ratted them out? If Edward Hospital CEO Pamela Davis of Naperville is any example, the lesson is doing the right thing is a double-edged sword. Davis was the company CEO who felt she was being shaken down by construction company executive Jacob Kieferbaum when she went to the Illinois Health Facilities Planning Board in 2004 to apply to build a hospital in Plainfield. She was told if she hired Kieferbaum to build the hospital, at a more expensive rate than a company she had already chosen, she'd get her hospital. If she didn't, no hospital. Davis went to the FBI, and the end result was the conviction of Kieferbaum, health facilities planning board member Stuart Levine and, on Wednesday, former political fundraiser Antoin "Tony" Rezko. Five years later, Edward still has no hospital in Plainfield, whereas if Davis had just gone along to get along, chances are it might. The company has applied again for a permit, but there's no guarantee it will be granted this July. I am tired of elected officials who are "saddened" every time one of their corrupt buddies goes off to prison. "On a personal level I am deeply sad for what's happened to Tony," our governor said. "I'm saddened by today's verdict. This isn't the Tony Rezko I knew ..."
...then maybe the solution is our leaders saluting the hero Ms Davis instead of the scoundrel Rezko? Seems the honorable thing to do. Of course Ms. Palmer's already talked, and Tony Rezko's in jail calculating the gain of starting to talk. So maybe the incentive is to say nice of Rezko fearing what he could say in return. And back in 2005 I was minding my own business when I received an email from the office of a certain junior Senator from Illinois inviting me to drop by to discuss his vision for fixing U.S. foreign policy. A one hour meeting with this man, Barack Obama, turned into such a staggering four hour tutorial (I was the student, he the teacher) that I decided then and there to leave my job as a professor at Harvard and move to Washington to work in his office. But since joining Foreign Relations, Obama has missed three meetings on a "new strategy" in Afghanistan, a country he has never visited. Clinton has ratcheted up her criticisms of the Illinois senator's experience and readiness to be president in recent days, specifically targeting Obama's foreign policy credentials. In their last debate before Tuesday's critical primaries in Ohio and Texas, Clinton hit Obama for not holding any oversight hearings on Afghanistan on the European Affairs subcommittee, which Obama chairs. Oliver Kamm giving some persepctive to Obama's closed door to Europe. The problem with Obama is that he evinces little interest in the role of America's European allies. There is a paradox here. Obama makes much (as he did in a long essay in Foreign Affairs last year) of the need to "rebuild our ties to our allies in Europe and Asia and strengthen our partnerships throughout the Americas and Africa". Yet his approach to foreign policy shows scant regard for the opinions of European governments or the requirements of collective security. It is as if President Bush's gratuitously brusque unilateralism has been retained but with a smiley face. Khalid Sheik Mohammed via WSJ with HT Transparent Eye. For the past five years, Khalid Sheikh Mohammed has been under the care of federal civilian and military employees who have taken an oath to “support and defend the Constitution of the United States.” The experience apparently has not enamored him of the document. At his arraignment here Thursday, the alleged 9/11 mastermind said he would not accept any attorney, even a fellow Muslim, “who is sworn to your American constitution.” Displaying a surprising understanding of such concepts as federalism and dual sovereignty, Mohammed referenced recent decisions by state courts in California and Massachusetts under the powers reserved to them under the Tenth Amendment. But little stood out more than toward the end of the process when, after a request from the judge, Ralph Kohlmann, Mohammed promised to protect classified information that is off-limits to the American public. Under the rules of the military tribunals, the Pentagon said the defendants would have access to all of the evidence presented in court, even if it is classified. The military said the rule would help guarantee the suspects get a fair trial although that assessment has been challenged by human rights groups. HT to Mark Rhoades at Illinois Review. ...Obama is simply floundering on issues that matter rather a lot. He says Iran is not a serious threat; he says Iran is a grave threat. He says al-Qaeda is not in Iraq; he says he's always said that al-Qaeda is in Iraq. He says he'll meet with the enemies of the U.S. without preconditions; he says that such meetings will take place with careful preparations and only if they advance U.S. interests. He says that Jerusalem must remain forever the undivided capital of Israel; he says that the future status of Jerusalem is negotiable. Speaking of floundering, anybody checked whether the levels of the oceans have started falling yet? HRC said she had been involved in politics for forty years and during those years there where ten presidential elections with Democrats winning three of them. Bill won two of the three she said. Sure sounded like a message to super delegates to me. Afterall, they can still change their minds. Walking down Roosevelt Road with my camera: Beer, Bread, and Italian Ice. The Onion takes a look at them. Global Labor: Who "sent" Obama? In Chicago politics a key question has always been, who "sent" you? The classic phrase is "We don't want nobody that nobody sent" - from an anecdote of Abner Mikva's, the former White House Counsel (Pres. Clinton) and now retired federal judge. (And someone I campaigned for while in high school when he ran, unsuccessfully, for Congress in the early 70s.) As a young student, Mikva wanted to help out the his local Democratic Party machine on the south side of Chicago. In 1948, he walked into the local committeman's office to volunteer for Adlai Stevenson and Paul Douglas and was immediately asked: "Who sent you?" Mikva replied, "nobody sent me." And the retort came back from the cigar chomping pol: "Well, we don't want nobody that nobody sent." And it turns out it was Ayers whole family, not just Bill. (Give's new meaning to playing the Excelon Card) considering Dad Ayer's connections with ComEd. One guess as to why Obama does not play up his educational experience more thoroughly now – it certainly could be of use to him one would think in beefing up his “I have the experience to be President” argument – is that it would lead to a renewed discussion of the Ayers connection, which is clearly toxic for Obama. This likely explains why Obama tried a kind of head fake when asked about Ayers by George Stephanopoulos in the TV debate with Clinton prior to the Pennsylvania primary. Obama said Ayers was a "professor of english." Yet, Obama chaired the Annenberg Challenge for three years and served on its board for another three years, working closely with Ayers on grants to Chicago schools. And he did not know that Ayers was a professor of education? That strains credulity. Perhaps this would be of just historical interest if it could be firmly established that Bill Ayers no longer has any role in the Obama campaign. But that is not something we know for sure yet. In a recent television interview with Greta Van Susteren (granted, it was on Fox), John Murtagh, a Republican town council member from Yonkers, New York, said that Ayers is currently an "advisor" to Obama. Murtagh has a particular and understandable sensitivity to the Ayers-Obama connection besides his Republican politics: his father was a New York Supreme Court (in NY the Supreme Court is a trial court) judge who presided over a trial of the "Black Panther 21" in 1970-71.